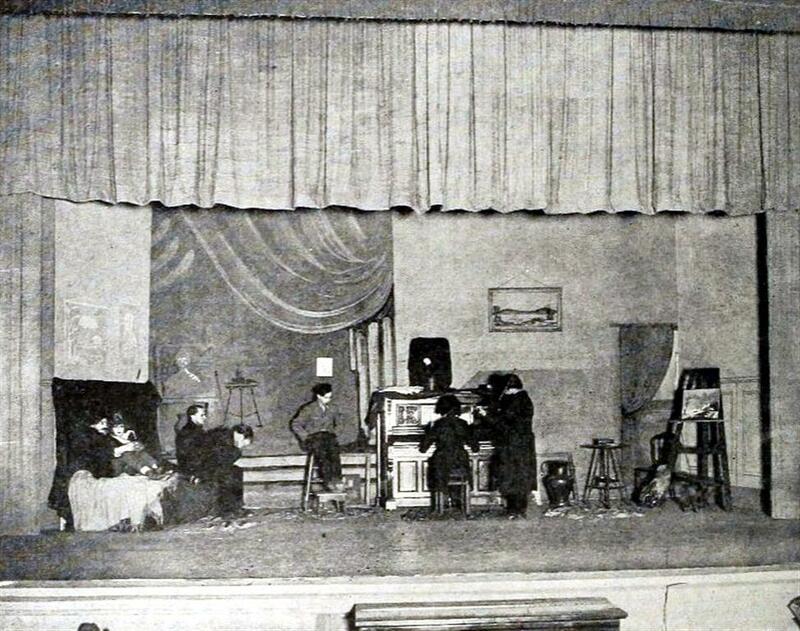 “The Kinema Theatre, one of the Gore Bros., Sol Lesser, and Adolph Ramish West Coast Theatres, Inc., chain, is giving its patrons an entirely novel form of stage presentation. Heretofore it has been the custom to create atmospheric prologues to mesh with the feature films. The new stage offerings at the Kinema are linked with music. “Famous paintings of musical history have been selected as the backgrounds. A series of art slides first are shown, giving a brief history of the painting for that week. The composer after whom the painting was created is then shown via slide route and the Kinema Symphonic Orchestra then gives a brief selection from that composer’s work. “A slide is then shown of the famous painting. Immediately afterward the curtains part, showing the exact replica of the canvass in the flesh. The Duffield, in downtown Brooklyn, is often criticized on cinema websites by those who only remember the theatre’s last years of operation. In some cases they repeat stories told by their parents. The Duffield’s early importance forgotten and ignored. “The front of the theatre is composed of tapestry brick with tile trim; an elaborate electric sign at the side lends distinction without being garish. “The lobby is finished in mission effect. The patron procures a ticket from an automatic ticket seller and enters the theatre. “The last row in the orchestra is distant at least sixteen feet from the entrance. The management has sacrificed all this seating space to make it a comfortable lounging place where one may stroll while viewing the pictures. “The house is about 74 feet each way. Its seating capacity is 842. The orchestra is sixteen rows deep and the columns supporting the balcony are so arranged that in no instance are they in line of screen vision. The slant is a decided one, so that a clear view is always possible. “There is an excellent orchestra, composed of five pieces with piano and organ, which is placed below the stage well out of the line of vision. They play consistent music, which quite often is classic. “The house is surround by alleys upon which fourteen exitis open; there are two more fire doors that are required by law, and a full house can be emptied in one minute without undue crowding. “Consideration of patrons is shown on every side. The retiring rooms are models of cleanliness; the thick, rich carpets yield gratefully to the feet; there is a counter where a desire for sweetmeats may be gratified, though candy is not hawked through the audience. “Programs and souvenirs containing the weekly bill are distributed to all patrons. “The projection booth contains 132 square feet and is built of concrete, steel and masonry. Extreme cleanliness prevails, the machines are thoroughly scrubbed twice a week. 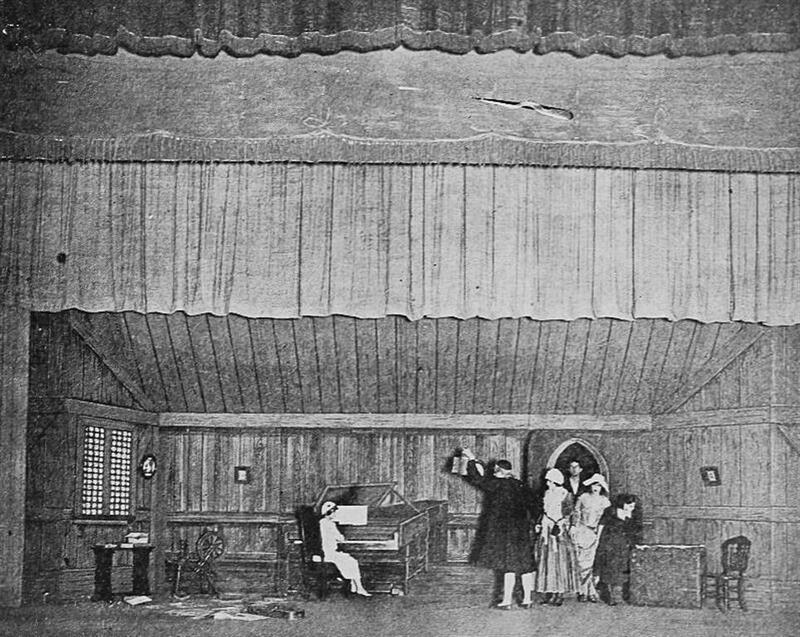 The throw is about 50 feet upon a white plaster wall screen tastefully draped; the size of the picture is about 11×14 feet. The Duffield opened December 5, 1913. A patron was shot during a screening of “New Jack City” in 1991. Closed by the NYPD for investigation, the space was later sold and demolished. 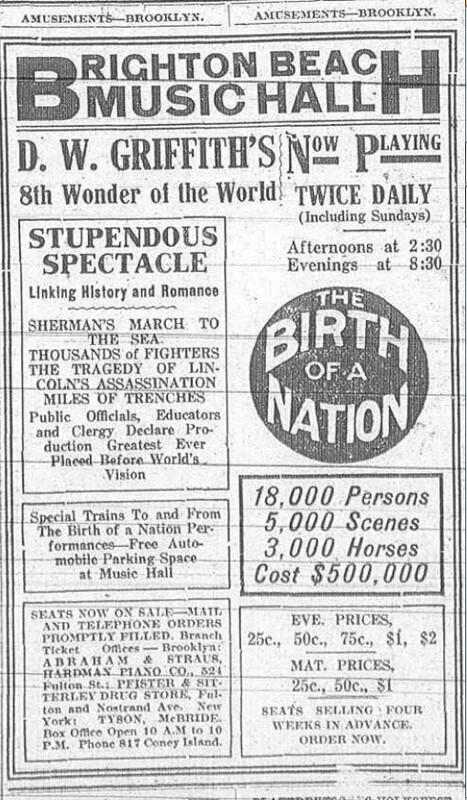 “When the history of motion pictures is written, ‘The Birth of a Nation‘ must head the chapter of the first great development in film productions” ( The Brooklyn Eagle, July 3, 1915). 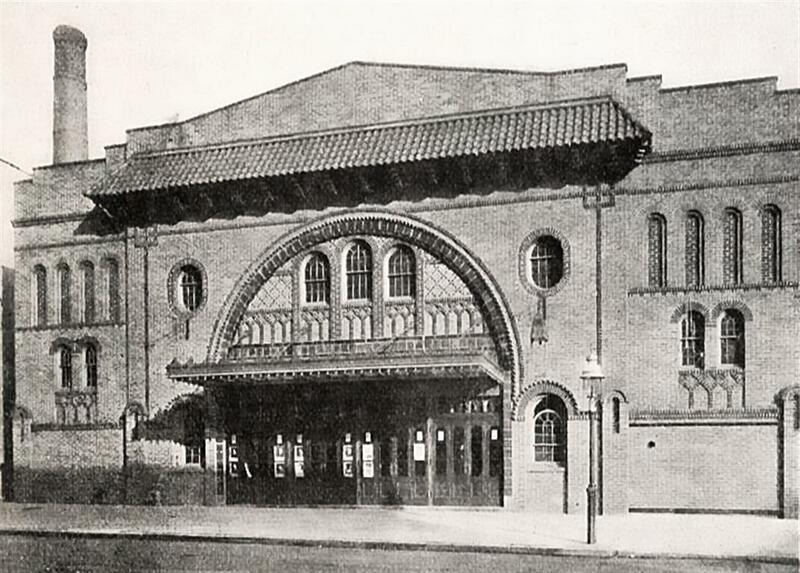 In 1915, William H. Kemble, manager of the Brighton Beach Music Hall, bid $65,000 for the “next set of films” of Griffith’s Civil War spectacle, inching out a theatre in Philadelphia by $2,000. Theatrical circles considered it a coup for Kemble since the film was still playing to capacity in Manhattan and theatres in all the big cities of America were bidding for it. When the film made its début as The Clansman at Clune’s Auditorium, in Los Angeles, an “augmented orchestra” of 70 provided accompaniment. William Kemble arranged for a “special orchestra of fifty” led by Louis Reinhard, musical director for B.F. Keith’s Orpheum Theatre. Reinhard, in turn, engaged George May, the musical director of Hammerstein’s Theatre in Manhattan, to assist him. 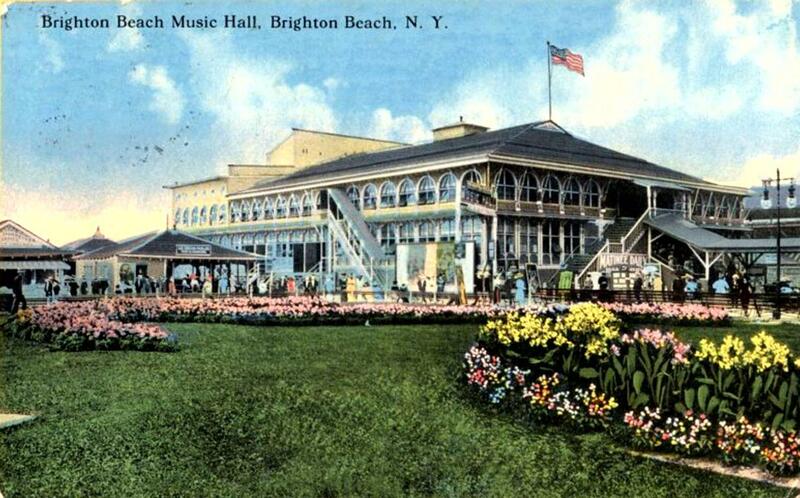 The Birth of A Nation made its Brooklyn début on the evening of July 2, 1915, with the Twenty-Third Regiment of the Old Guard of the Civil War Veterans and the Officers of the Ninth Coast Artillery marching pass the Brighton Beach Hotel. Mayor John Mitchell and Borough President Lewis H. Pounds were suppose to review the troops but both failed to show. This left Public Works Commissioner Edmund W. Voorhries to represent the city at the special performance. Setting the martial tone for the evening, the troops filled the Music Hall balcony and marched out in unison at the end. An audience of “considerable distinction” gathered afterwards at the Brighton Beach Hotel for a reception and dance arranged by the Music Hall management. The old Sanders Theatre was closing for the second time when I moved to the Slope in 1978. The neighborhood had not yet been gentrified. There were bodegas, greasy fried chicken and soft ice cream on 7th Avenue. The Miami fruit market had been around since the 1940s. The Shirts, a “power pop band” rented a loft for $250 a month. Harriet Hoffman had a pottery studio on 9th Street at 7th Avenue. She gave free lessons to school classes. The Park Slope brownstone community begun to change, rents went up, many of the older places couldn’t afford to hold on and closed their doors. The Sanders stood decaying on the corner of Prospect Park West and 15th Street. Plans to multiplex the balcony, while converting the first floor to a hardware store, never came to fruition. One movie house remained in the neighborhood, the worn Plaza Theatre on Flatbush. In September 1994 Manhattan theatre exhibitor, Norman Addie, purchased the Sanders, renaming it the Pavilion, converting it to a triplex and adding a café to the balcony level. Carl Giangrande served as architect. Addie also acquired the Plaza, the theatre’s ceiling collapsed as the workers were starting renovations. Additional screens were added with the Pavilion seemingly popular with the local neighborhood. Eventually, however, Addie failed. American Apparel took over the Plaza and Cinedign the Pavilion as its digital showcase theatre. Recently the Pavilion has come under adverse criticism. It fell under the bed bug hysteria that gripped so much of New York. A woman claimed to have been bitten while watching a film. However no solid evidence was forthcoming. The same could not be said for the deteriorating condition of the cinema. The sorry state of the Pavilion became a topic with numerous blogs. 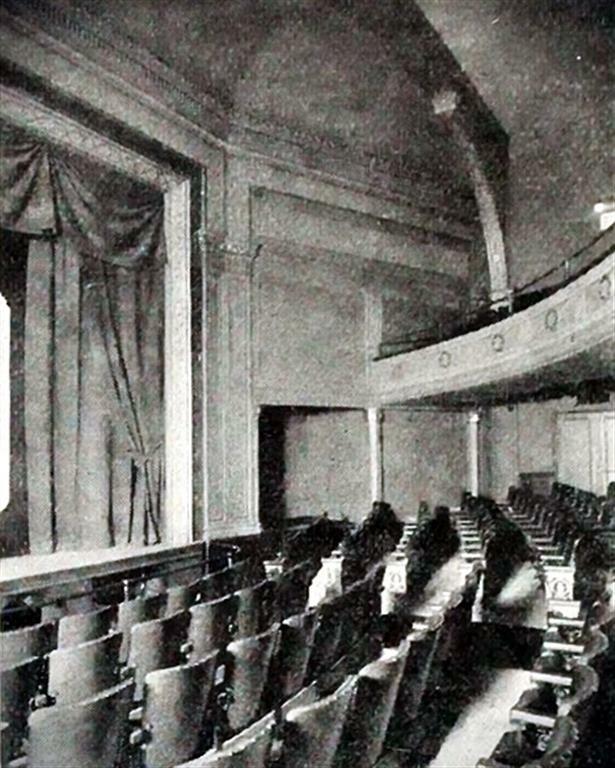 The Brooklynian reported “seats with no backs, seats with no…seats, seats with stains and random food particles and hair.” The article illustrated with five photos. The beleaguered staff sent an email apology to Park Slope Parents about the state of the Pavilion, blaming ownership for the current state of the theatre. Finally Jill Calcaterra, Chief Marketing Officer for Cinedigm, came forward, stating that there would be “big changes” with the Pavilion undergoing a major renovation (Park Slope Patch). 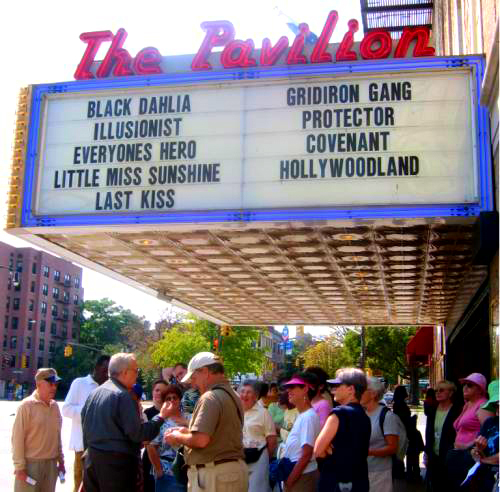 The Pavilion had just opened when I gave my first Park Slope theatre tour for the Brooklyn Center of the Urban Environment. The new multiplex had met with opposition. A person living on 15th Street demanded in the local press that a study be conducted on the impact of opening a movie house in a residential community. Not realizing there had been cinema on that corner since 1908 (the original Sanders Marathon). At the start of the walk, I quoted this person and posed the question what was the impact on the neighborhood when the Sanders opened in 1928 with eleven other theatres in the Slope. What was it like on the streets of Park Slope when these places spilled out on a Saturday night? What was it like at the restaurants and the soda fountains? The Brooklyn Paper, with a slight dig at the Park Slope Patch blog, states that the “Pavilion will be a movie palace again.” That it was never actually a movie palace doesn’t enter into the equation. Oh, by the way, there is no word from the Patch about the suppose feud with the Brooklyn Paper.